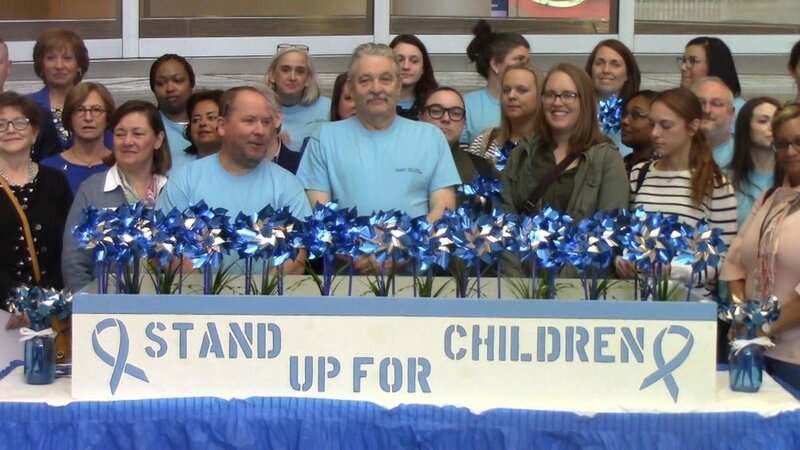 VIDEO: Blue pinwheels are popping up all over Delaware in April in recognition of Child Abuse Prevention Month. Although there has been a steady rise in calls to a state child abuse hotline in recent years, advocates said Wednesday much progress has been made in recognizing one thing: abuse is never the child's fault. "Tragically, sexual, physical and emotional abuse threaten too many children every day in communities across our nation," Dr. Stephanie Deutsch said at A.I. duPont Hospital for Children, where she is a pediatrician. A variety of factors - some very familiar, some relatively recent - contribute to an abusive situation, according to Prevent Child Abuse Delaware Executive Director Karen DeRasmo. "Those can include things like poverty and substance abuse. We know that the opioid crisis has created a lot of difficulties for families with children," DeRasmo said. "We have children being born addicted to substances." Poverty and financial stress can also play a part. DeRasmo added that in about 90 percent of child abuse cases, the abuser is a relative or someone known by the child. However, strides are being made in recognizing and addressing the problem of child abuse. Delaware First Lady Tracey Quillen Carney is coordinator of First Chance Delaware, an initiative to help give children in The First State a chance to succeed. "Our understanding of risk factors and trauma in general has increased so much over the last 30 years," Mrs. Carney said. "I think we're really at a tipping point where can make a difference in preventing child abuse through the multi-disciplinary approach." DeRasmo added that all of us can be more alert for indications of possible abuse or potential abuse. Even if it's something as simple as a parent yelling at a child in a supermarket, consider initiating a discussion, perhaps telling the person how lucky he or she is to be a parent. Also, if you feel yourself about to lose your temper with a child, DeRasmo says something as simple as taking a deep breath, counting to ten and smiling can go a long way toward calming you down. "It's never a child's fault if they're abused or neglected." Reminder: She Doesn’t Owe Anyone a Hug. Not Even at the Holidays.